VL12 is the shade I’m reviewing today. It’s a midtoned (perhaps on the deeper side of that spectrum), slightly dusty, amethyst purple cream. The dustiness comes through differently depending on the lighting; sometimes it doesn’t look especially dusty at all, and other times it looks greyed. It’s an odd quality! In my swatch, it looks a little less dusty than it can. 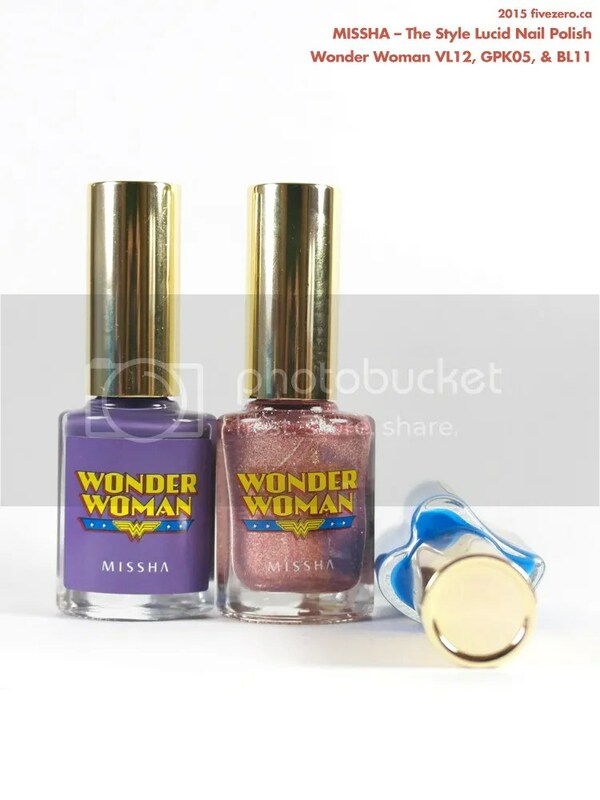 I didn’t know this going in, but this line of nail polish is temporarily scented! 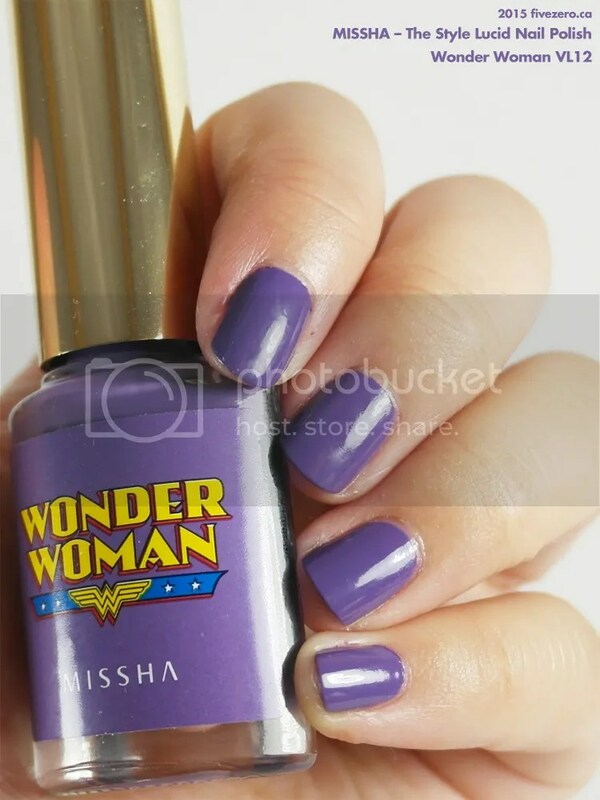 Now, I’ve mentioned in the past that I’m not a fan of scented nail polish, but this one, I like. The scent is a bit strong out of the bottle, and it first struck me as being minty. Eventually I realized it is actually rosemary, but it’s a very effervescent sort of rosemary—not the kind that wafts off a rosemary & lemon roasted chicken (best way to make one!). I kind of love it! Yes, it’s still got a bit of that nail polish smell to it, but this is definitely the nicest nail polish I’ve sniffed. And, as I mentioned, it’s not permanent: I noticed that the scent disappeared about ten minutes or so after the polish dried. Perfect, to me. On to the polish. It is close to being a one-coat wonder, but isn’t quite. The formula has a nice, not-too-thin-nor-too-thick consistency and the pigmentation is good. Two coats are needed for full opacity. The polish applied quite smoothly and evenly; I was overall quite pleased with the performance. It also dried to a reasonably glossy shine, considering how quickly it dried. Despite the bottle’s smaller volume of 8 mL, the bottle still looks deceptively large due to its design. The cap is oversized (nice to handle; my only complaint is it could use some grip) and the bottle has a lot of height and width, at least from the front. It really looks around the same size as a typical 15 mL bottle! In any case, for just under $5 at full-price, I think these are a really nice deal and I can’t wait to receive my second haul! 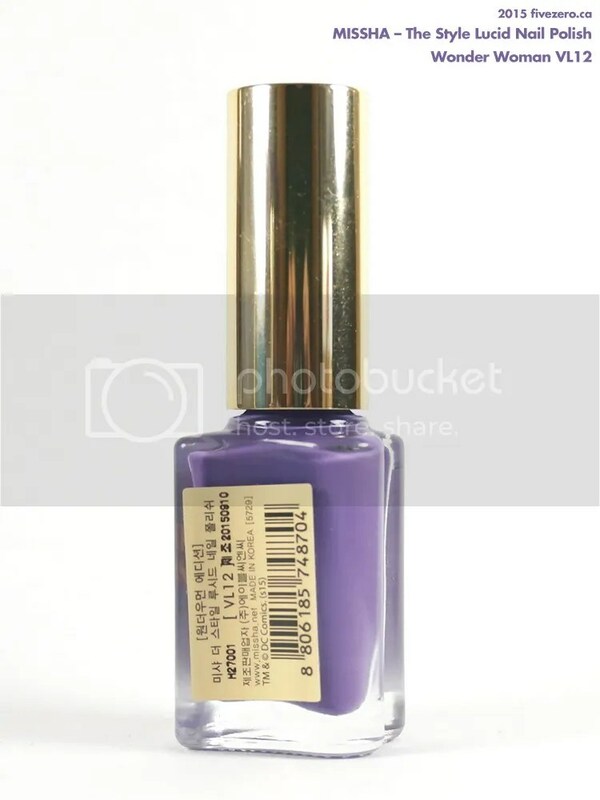 Missha The Style Lucid Nail Polish retails for CA$4.29 (at Missha Canada*) and is 8 mL. I couldn’t find an ingredient list, so I do not know whether this product is 3-free. It is made in Korea. 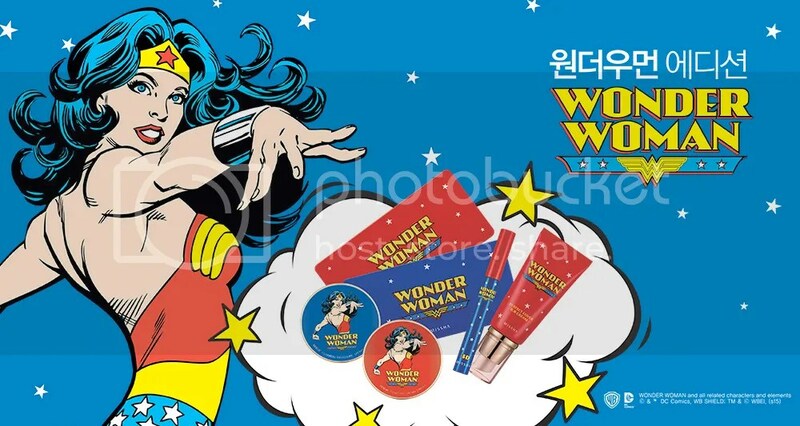 * I ordered my polishes from a Korean online store, as mentioned above, where they retail for just under US$5, but shipping is free for all orders, I did not have to pay sales tax and duties (keeping my order under ~$30), and they sell plenty of other brands. At Missha Canada, the polishes are cheaper, but sales tax is 13%, shipping is only free with a $59 purchase, and only Missha products are available. I was unable to load the Missha US site to check US prices. 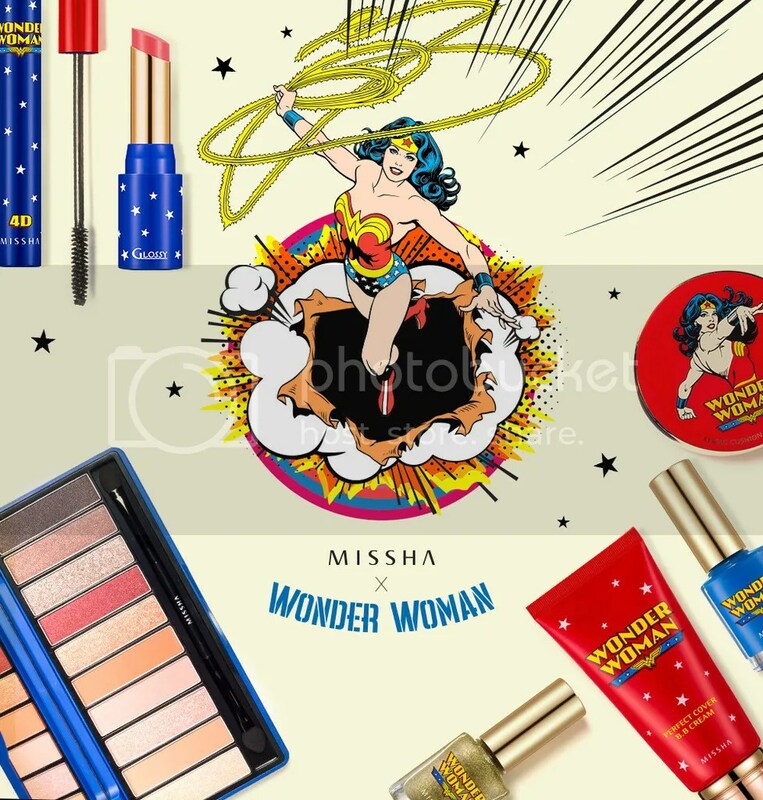 Missha Cosmetics was launched in 2000 by its parent company, Seoul, Korea-based Able C&C Co. Ltd. It has since grown into an international brand with stores all over the world. Oh my goodness! 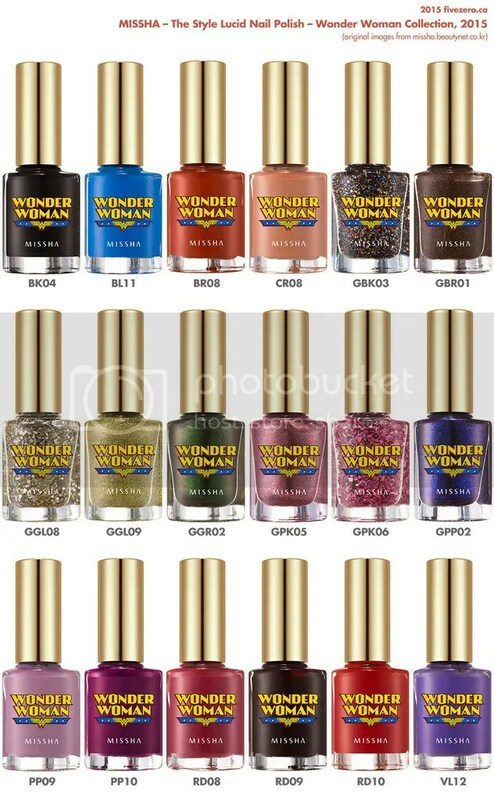 I want these polishes!! Why have I never heard of this brand!? Looks like they have a good bunch of polishes! Also the packaging is too cute, heat shaped bottles…yes please! You definitely should try Missha out! I mean, I just have these polishes and a couple of their BB creams 😀 But I love the M Signature BB Cream, in particular. That’s SO awesome! Missha did a better job than when MAC did it. I didn’t even notice the oddly shaped bottle until you laid it down – it’s the small details! This shade is really nice too. Their promo pic colours are pretty spot on to the actual colour too. I’ve never heard of Cosmetic Love site… will be bookmarking that for a later date! I know, I looked at the bottle pics for ages before ordering, and it never occurred to me that the caps were off-center. :O Duhhhh. When the bottles arrived, it was quite a nice surprise that they were so cute. This purple did photograph a bit less dusty than it actually is. Weird. I have placed too many orders from CL since I found them! Aaaaah. Bahahaha! I know, and the site is PURTY, too. Or at least the product pics are nice. I am afraid to ask, but do you know of any other similar sites? NOT THAT I NEED MORE STUFF, RIGHT. 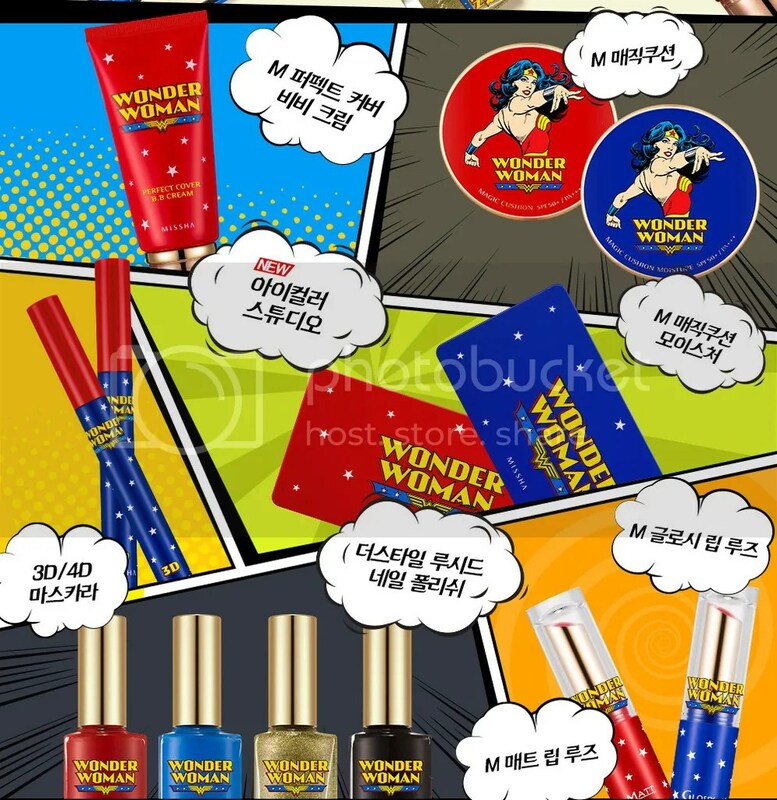 BTW, CL send lots of random samples, too. 🙂 In my last order with the Misshas, I got 8 of the Tonymoly tomato packet thingies. Wow! Such a pretty cool purple nail shade and I totally love it. I love Supergirl! She’s so likable in this series compared to her debut in Glee. I’m glad you’re enjoying the show! I stopped watching Glee after the 2nd season, so I’m not familiar with the actress (I don’t think). Probably not. She came in as a freshman that could sing well when the bulk of them graduated. Woah, those are super cool! And that one purple you’ve highlighted there is AWESOME. How did I not know about these?